The Rundown: King Lollipop, a Surf Pop band originating from Portland, Oregon, features Cody Blanchard. King Lollipop has released one album, Woodland Whoopee Songs of Ol’ Callowhee, which is available from 1-2-3-4 Go! Records in cassette form and should be coming in vinyl form soon. Cody Blanchard also makes up one-half of the band Shannon and the Clams. King Lollipop sounds like a throw-back to 60s Surf Pop. It’s a very refreshing sound in today’s musical world, and a fun one at that. Cody has a scratchy, somewhat abrasive sounding voice that is contrasted brilliantly by the easy-going nature of the acoustic sound of King Lollipop’s music. I couldn’t find more than two videos on YouTube, but if you want to hear more from King Lollipop, check out their Facebook page. 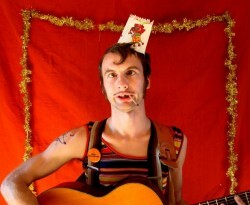 MarBands.com thinks King Lollipop has a wonderful sound reminiscent of the days when music was fun, new, and unique. We definitely think this is music you need to hear.